This is a developing story based on breaking news this morning. It will be updated as more information becomes available. 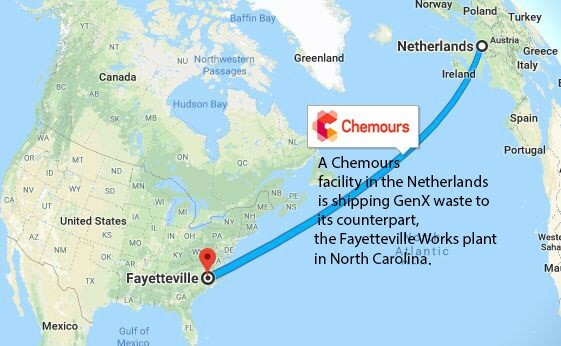 NC Department of Environmental Quality officials knew the Fayetteville Works plant was importing GenX compounds from a Chemours counterpart in the Netherlands, and spoke to the EPA about the issue on Dec. 13, 2018 — five days before an EPA attorney requested more information from Dutch government officials about Chemours’s practices. According to an email provided by DEQ, officials within the Division of Waste Management sent the EPA a list of questions about the imported waste, most of which then appeared in the EPA letter. DEQ knew on Jan. 18, 2018, that the Fayetteville Works plant was importing GenX compounds from overseas, agency officials said. This knowledge was accidental: While DEQ inspectors were onsite conducting a plant visit, a Chemours employee mentioned it. Those inspectors then informed their superiors at the agency. The imported waste does not affect the proposed consent order, agency officials said. All waste, whether imported or generated onsite, are both covered under the proposed consent order. That order regulates all discharges, regardless of the waste’s origins. According to the DEQ notes to the EPA, the European Union regulates GenX compounds as hazardous waste, but the US does not. That has created concern within DEQ that the exports from the Netherlands could have been intended to circumvent EU law. It’s still unclear how long the Chemours plant in Dordrecht has been exporting GenX compounds to the Fayetteville Works plant. In 2017, Dordrecht government officials issued discharge permits that reduced by 68 percent the allowable amount of GenX that Chemours could emit in wastewater, according to an article in the peer-reviewed journal Environmental Science & Technology. Presumably, that waste had to go somewhere besides the river. Concentrations of GenX ranging from 1.7 parts per trillion to 812 ppt had been detected in river water downstream of the plant. One upstream site had a concentration of 22 ppt, which the article authors theorized could have occurred because of tidal currents pushing the contaminants in that direction. I Am ashamed of 99% of the human population on our beautiful Earth. And our country, the USA is in shambles. Yet every day I get up, love my loved ones, friend, neighbors, pets, and grown children,hoping for a better future. And go to work happily because I have a great job. I can do everything I can as one person and have taught my kids to be good humans. And be a positive influence to anyone throughout every day that can make eye contact give them a friendly smile. This crap our government approved and has now been exposed, is a drop in the bucket of the blinds on our endangered shielded eyes and minds due to greed and corruption in our country, the United States of America. I am appalled at our neglect .This would seem to be an unlawful act which should not go unpunished. I worked as a lab technician at the DuPont plant in Wilmington, NC in the 70’s and am ashamed to have been involved with this company. At that time the plant was very careful with what went back into the river( according to testing and requirements at that time), but now I worry we may have been misinformed by the company’s executives. I am anxious to learn more about this as the investigation unfolds. Our Congress and the President must take action to protect our earth. What good is it to have a strong economy if we all die in the process? There has to be a way to protect the earth and still be secure financially. Unfortunately, the poor environment affect most often the less fortunate who are not privy to the “cleaner” food and water products. I will vote my conscience and encourage ALL to do the same. This makes me sick!! How could customs have allowed these shipments without inspecting them. We have to do better as a nation to protect our citizens. This is so disheartening!! I hope this company hasn’t caused some serious contamination to the drinking water. My precious family lives in Fayetteville and I am seething right now after reading this! doing to not only their neighbors but to their own families including their children. any group to help prevent this.